Are you looking for an easy way to be more efficient with both your water and electricity use, but don’t want to drastically change your daily routines? If so, you’re in luck. By swapping out your old shower head for one that’s more efficient you’ll accomplish both of your savings goals, and the best part is you won’t have to change any of your daily usage habits. Every heated gallon of water used in your home contributes to both your water and electric bills, so by installing a more efficient shower head you’ll reduce the work load on both. Thus, you’ll be saving money on both of your monthly utility bills and eliminating CO2 emissions in process! 1. Remove your old shower head. To do this, simply turn the entire unit to the left. If the old shower head doesn’t move independently of the water line, try using your wrench to get it started. Once it’s loosened, continue unscrewing the old shower head till it comes off completely. 2. Apply a thin layer of teflon tape to the threaded end of the water line. Take your teflon tape and place a thin layer of it around all the threads in the water line. This will help to ensure a snug fit between your new shower head and water line. Once you’ve covered all the threads, take your scissors and remove any excess tape. 3. Attach your new, more efficient shower head. Simply take the new shower head and screw it onto the threaded end of the water line. It doesn’t need to be much more than finger tight, so take your wrench and give it a slight turn to be sure it’s attached securely. Remember, turning it to the right will tighten it. 4. Test your shower head to be sure it’s installed properly. Now that you’ve got the new shower head in place it’s time to test it. 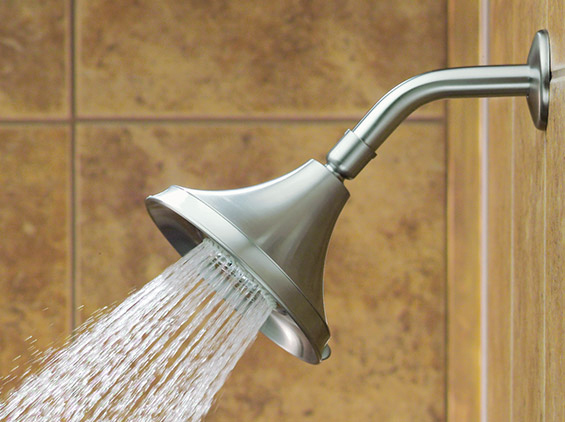 Turn on your shower as you would normally and watch to see if any water leaks from around the shower head. If so, you probably just need to tighten it. However, if your shower is working properly your good to go. Now all you have to do is stick to your daily routine, and in doing so you’ll use less water and electricity in the process. If you’re curious about other ways that you can save, check out this article on saving energy by saving water. Also, be sure to check out our other green home improvement projects: Green Living Ideas, after all, is a top 20 home improvement website! Photo courtesy of Leduc and Dexter Plumbing.